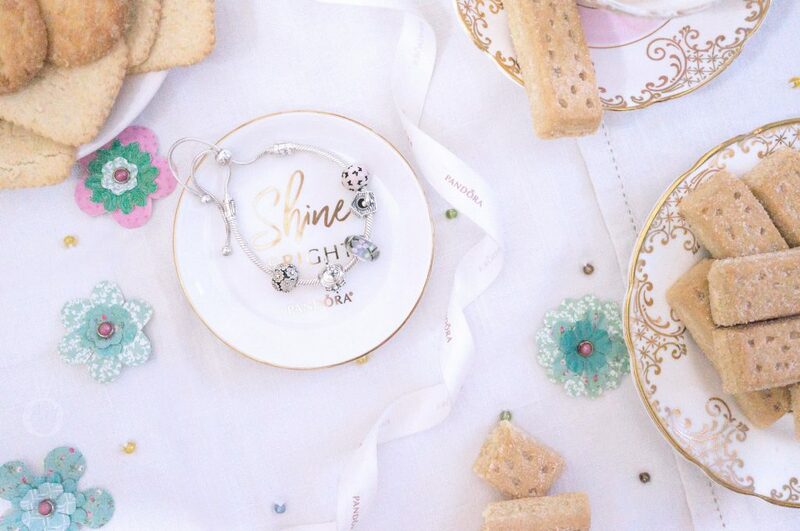 Pour a dash of fairytale appeal to your bracelet with the delightful Enchanted Tea Pot charm. 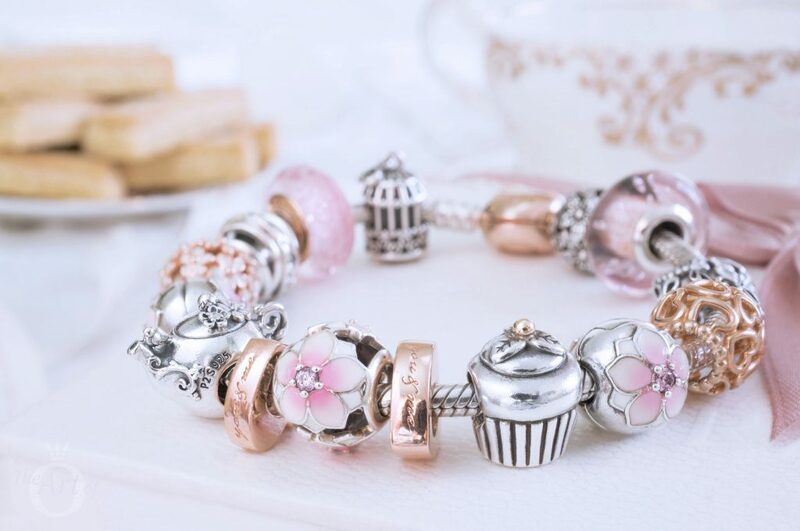 If, as they say, the best stories start with a cup of tea, then what better way to tell that story than with the wonderful PANDORA Enchanted Tea Pot charm! As an Englishwoman who takes tea very seriously, I was captivated by the beauty of the Enchanted Tea Pot (797065CZ) charm. 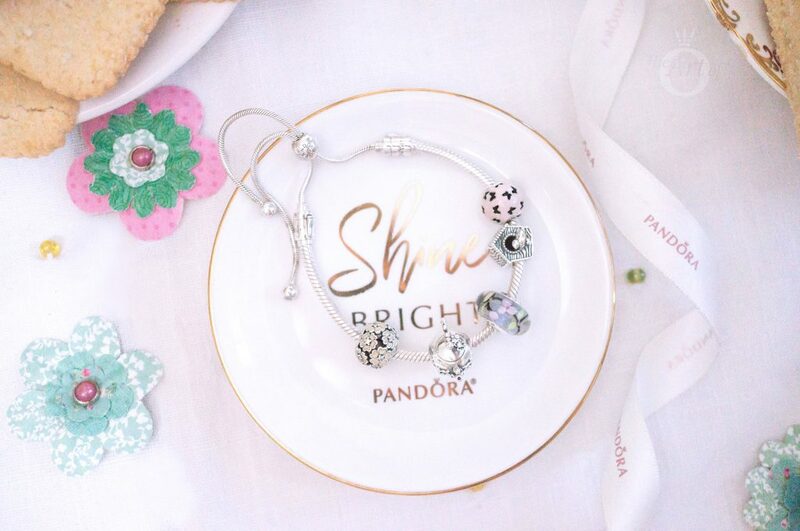 Part of the PANDORA Spring 2018 Collection, the dainty tea pot is filled to the top with whimsical fancy and it was an instant must-have for me. Covered with swirling branches and leafy vines, the Enchanted Tea Pot charm has a fitting name. There is so much detail in this charm that it’s hard to know where to start. One is the slight dip that is formed around edge of the tea pot’s lid. It gives me an overwhelming desire to lift it by its carved pine cone knob and make a lovely pot of tea! Two pretty flowers decorate the lid of the Enchanted Tea Pot. The larger of the two has petals filled with a soft pink enamel. The shade of pink is so subtle and doesn’t overpower the charm, but adds a touch of romance. A sparkling clear cubic zirconia stone gleams at the centre of the smaller flower. Although the overall appearance of the Enchanted Tea Pot charm is polished and shiny, there is a fair amount of oxidised detailing. The oxidisation around the spout emphasises the petite bird who is taking rest on the tea pot! The PANDORA hallmark is clearly stamped with ‘P2 S925 ALE’ on one side. 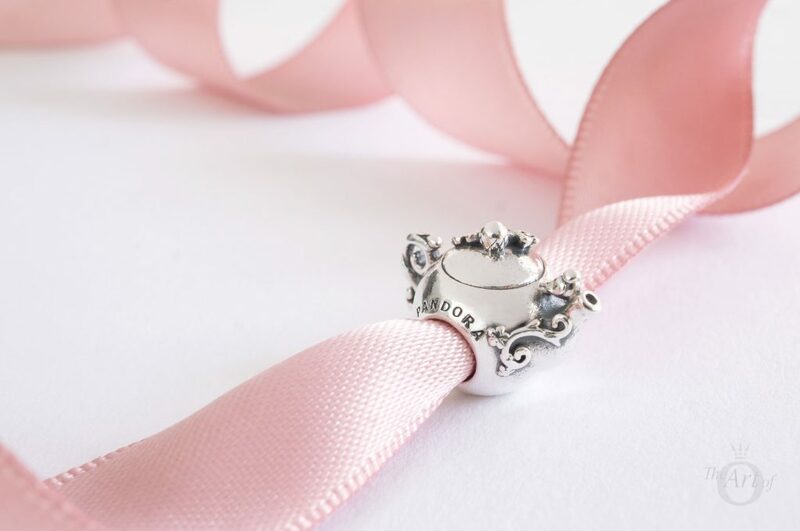 The other side of the Enchanted Tea Pot charm is engraved with the ‘PANDORA’ makers mark. From this angle you can see how the little bird is alert, watching and ready to take flight. The Enchanted Tea Pot is quite a lot larger than the retired PANDORA two tone Teapot (790250) charm. I quite like the bigger size, as it allows for more embellishments like the flourishing handle and spout. Whereas the smaller, older Teapot charm has a simpler, more straightforward design. When I first held the PANDORA Enchanted Tea Pot, I was surprised at its weight! In fact, I believe it is most likely the heaviest charm in my collection. It’s a solid, threaded charm with a bulbous shape. Other than a slightly flat bottom, it is almost completely spherical. When I first saw the PANDORA Enchanted Tea Pot I thought it would be perfect for a Mad Hatter’s Tea Party theme. It turns out I’m right! The light weight Mesh Bracelet (596543) provides a pretty backdrop for this theme which is ideal for the Summer months. I used the PANDORA Disney Thumper (796342) charm as a cute substitute for the White Rabbit from Alice in Wonderland. The actual PANDORA Disney White Rabbit (791898ENMX) charm is very sweet. In the charm he is depicted mid run, holding his large watch and worrying about being late. 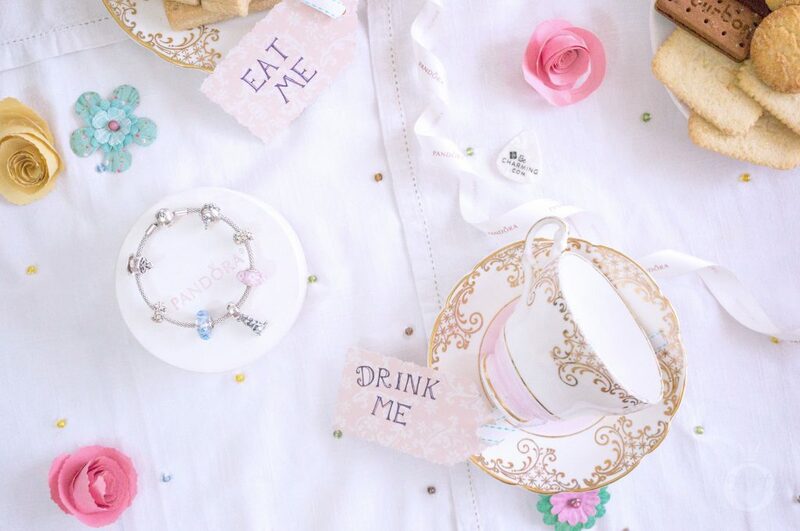 If you would like to create an Alice in Wonderland theme, the White Rabbit charm is currently in the sale on BeCharming.com with a 45% discount! Plus the Alice’s Tea Party (791896ENMX) and Alice’s Magic Potion (791897ENMX) charms are also in the sale. 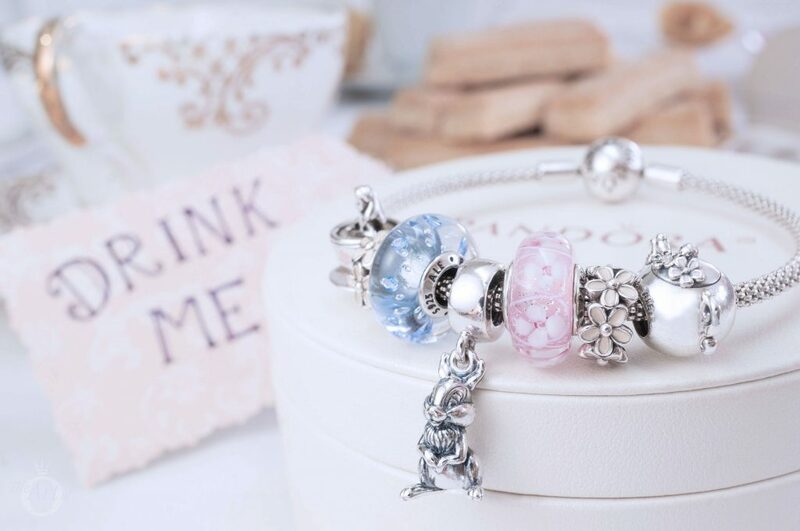 Of course it wouldn’t be an Alice in Wonderland bracelet without a curious Alice. A shrunken Alice in a Tea Cup (792126enmx) charm sits on one side of the design with the Enchanted Teapot on the opposite side. 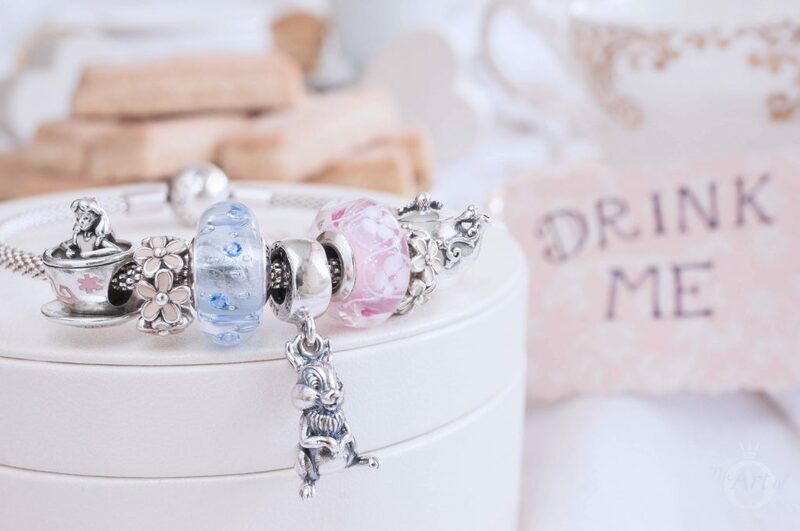 The beautiful blue Ice Drops Murano (796365CZB) is a perfect shade to represent Alice’s famous dress and the Pink Fields of Flowers Murano (791665) compliments the pastel pink enamel on the Tea Cup charm. Both the Ice Drops and Field of Flowers Muranos are included in the 45% off PANDORA sale at BeCharming.com! The PANDORA Ice Drops Murano is one of my most used murano charms. 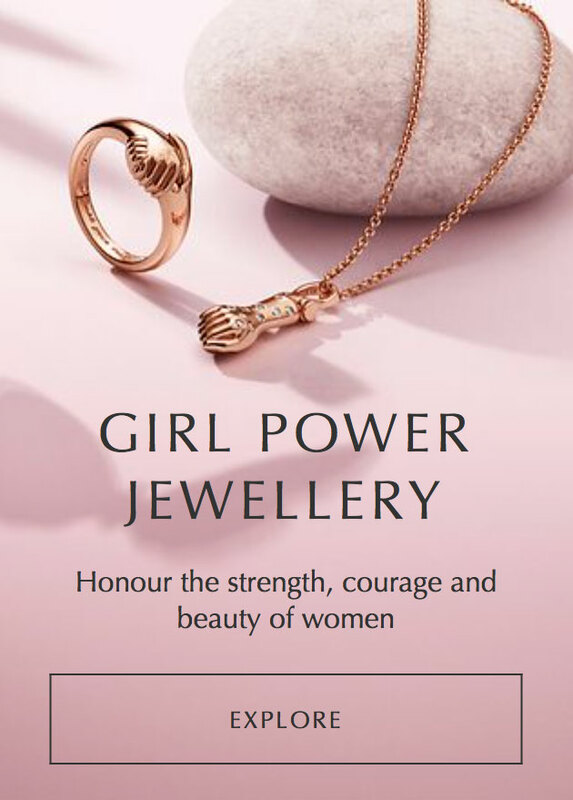 If you haven’t yet added it to your collection you can currently purchase it for just £15 at the PANDORA UK eStore sale. One of my favourite childhood memories was the time I attended a teddy bear’s picnic with my family. After that first picnic, I often laid on cosy picnics for my bear companions. My second styling with the Enchanted Tea Pot charm pays tribute to those happy days. Of course tea and biscuits are a bear necessity! 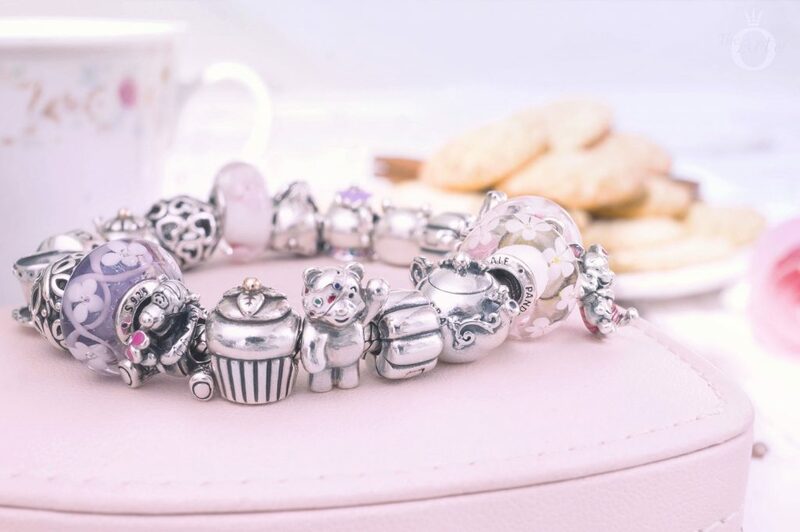 The classic PANDORA Moments Bracelet (590702-HV) is perfect for this youthful theme which is full of teddy bears with their friends and tea time treats. 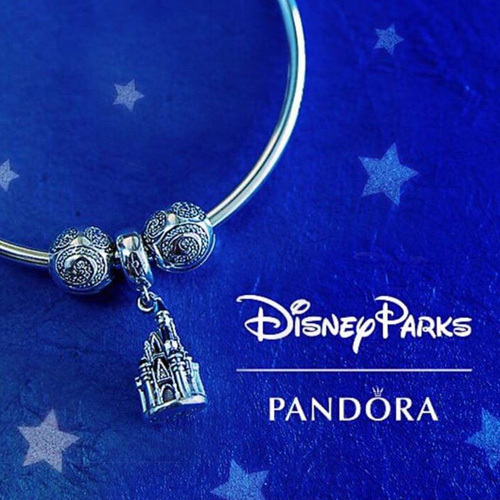 Hanging at the centre of the design is the PANDORA Disney Piglet Pendant (792134EN117). Piglet is delighted to be attending the teddy bear’s picnic with his own little teddy! The Disney Tigger (792135EN80), Eeyore (791567EN80) and the Winnie the Pooh Portrait (791566) charms are also present and Eeyore is happy being grumpy while Tigger picks flowers. I’m worried that the two tone retired Cupcake (790417) charm won’t stay around for long with Pooh bear and his hungry tummy around. 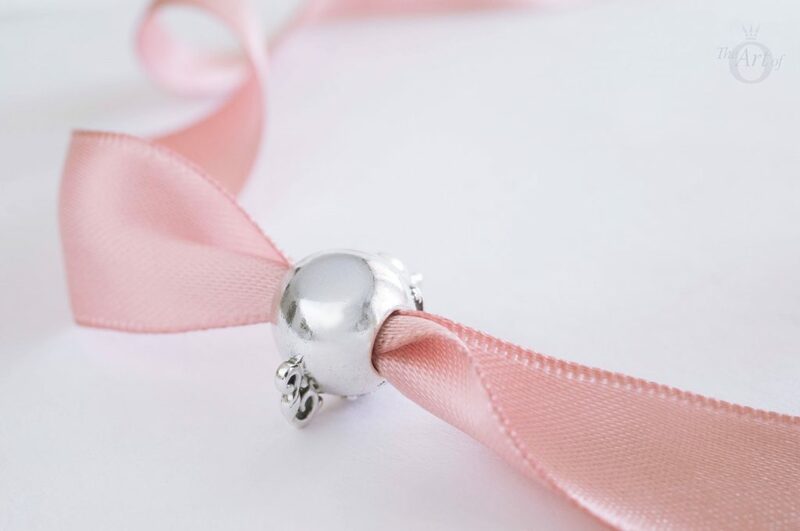 If you want to add a cupcake charm to your collection, an alternative is the more recent Sweet Cupcake (791891EN68) charm which is iced with pretty pink frosting with clear cubic zirconia sprinkles. 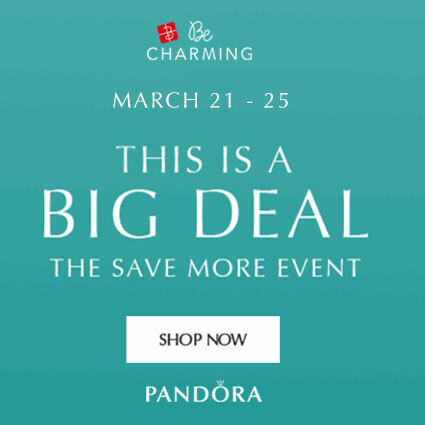 Plus, if you are a big Winnie the Pooh fan the Winnie the Pooh Portrait charm is in the US PANDORA sale at BeCharming.com! A cup of tea is an excuse to share great thoughts with great minds. In my third styling I leave the teddy bears in the woods and travel to Claridge’s, London for a spot of high tea. Like the famous Claridge’s of Mayfair, the combination of silver, PANDORA Rose, and delicate hand painted enamel is pure elegance. 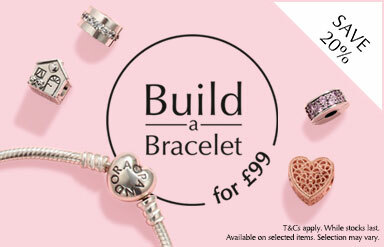 The PANDORA Rose Heart Clasp Bracelet (580719) is ideal for a mixed metal styling. 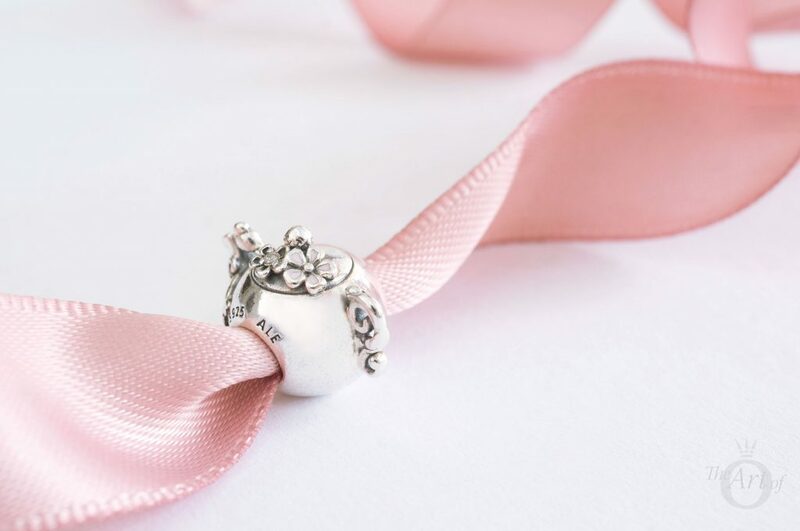 Plus, if you only have a few PANDORA Rose charms its glowing clasp resembles a charm and adds to the rosy hues. The Magnolia Bloom (792087PCZ) charm looks splendid between the PANDORA Rose Two Hearts Spacers (786559CZR) and the matching Magnolia Bloom Clips (792078PCZ) blend fabulously with the two tone and PANDORA Rose charms. 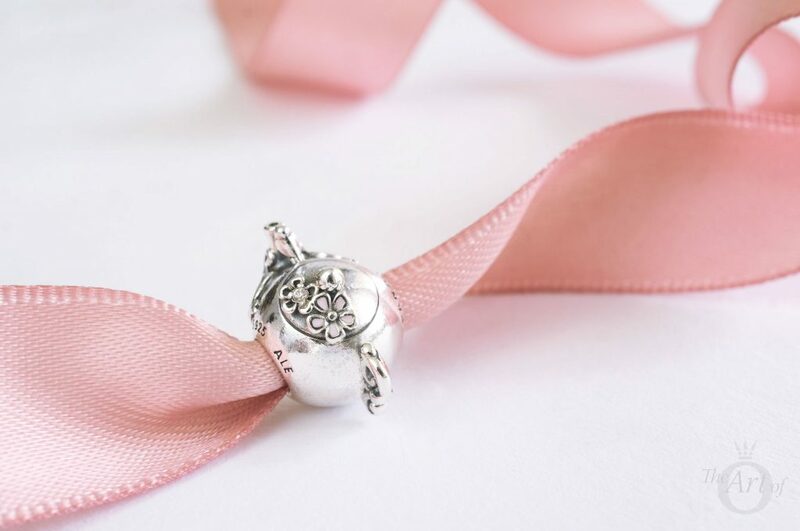 If you are collecting PANDORA Rose charms there are quite a few in the current sale at BeCharming.com, including the Darling Daisy Meadow (780004EN12) charm which features in this styling. Also in the sale is the Pink Glitter Murano (791670) charm which is stunning with its golden sand like flecks. If you want an alternative look to the Magnolia Bloom Clips, the Blooming Dahlia Clips (791828NBP) also look beautiful paired with PANDORA Rose. 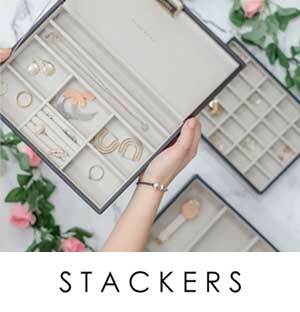 They also are part of the sale at BeCharming.com and have a 45% discount. 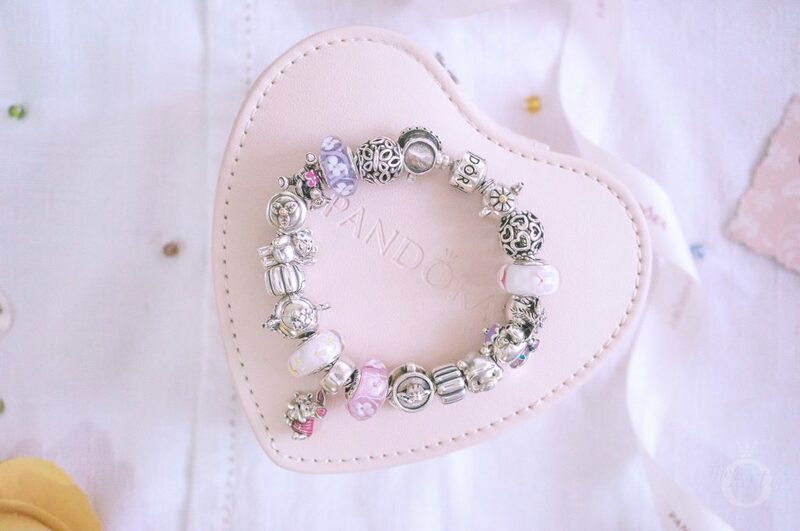 If you are in the UK, the Pink Glitter Murano is currently in the sale at the PANDORA UK eStore for £19. Tea is the answer to most problems and suitable for every occasion. And now that Summer is here and the sun is out, what greater joy could be know to man than a nice cup of tea in the garden? A second cup! The final styling with the Enchanted Tea Pot charm is a tribute to life’s little pleasures; tea, warm sunshine, fresh air, fragrant flowers and sweet birdsong. The relaxed Moments Sliding Bracelet (597125CZ) is ideal for this casual style. The chunky feel of the Spring Bird House (797045) charm creates balance opposite the Enchanted Tea Pot and the pretty pastel shades of the Enchanted Garden Murano (797014). Tea is the finest solution to almost every catastrophe and conundrum. The pink enamel Fluttering Butterflies (791483EN68) charm and the charming Primrose Meadow (791488EN12) complete the look. 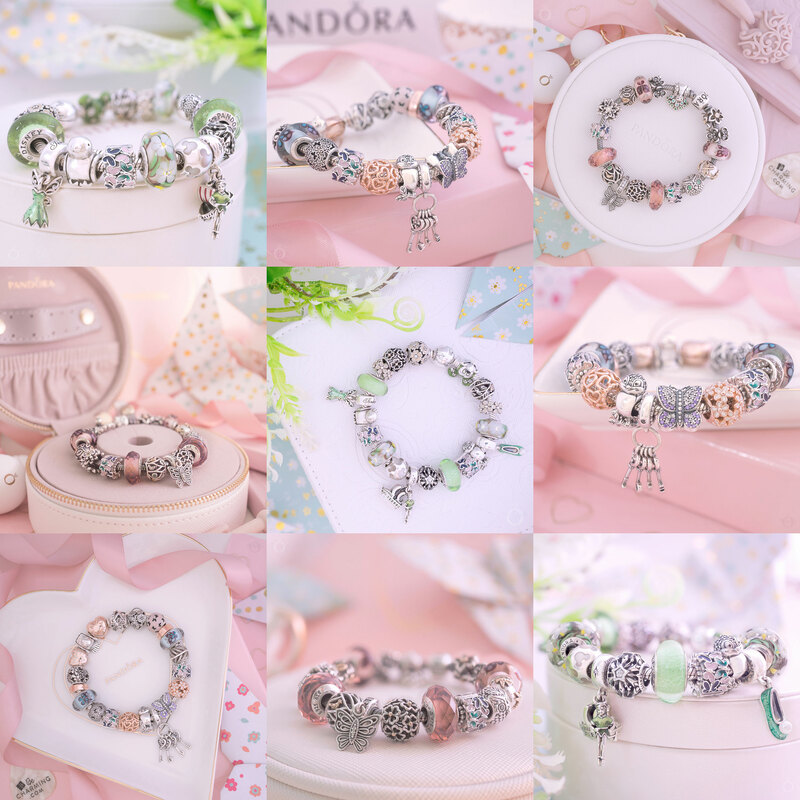 Both the Primrose Meadow and Pink Primrose Meadow (791488EN68) charms are available with a 45% discount in the current PANDORA sale at BeCharming.com. 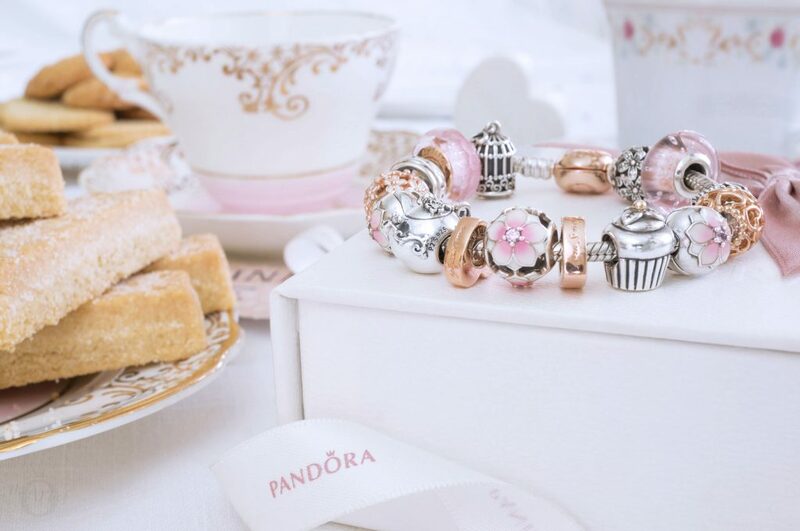 In the UK the Pink Primrose Meadow is now £29 in the PANDORA UK eStore sale. 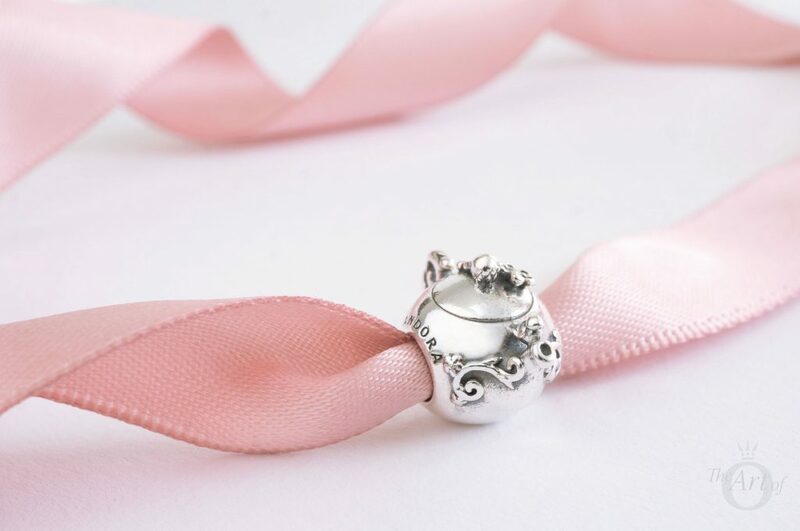 My verdict on the PANDORA Enchanted Tea Pot charm? Just my cup of tea! The only area that doesn’t receive 10/10 is the wow factor. 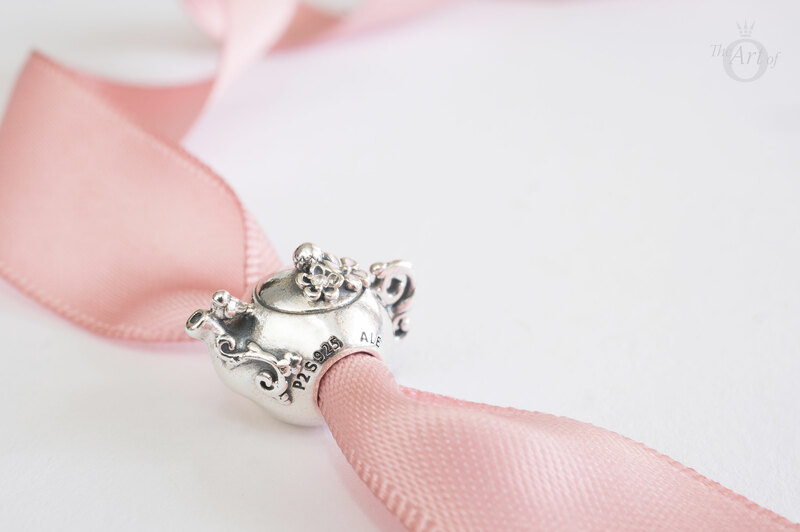 There are lots of wonderful details on the Enchanted Tea Pot charm, but it is only when you look quite closely at it that you really begin to appreciate them. 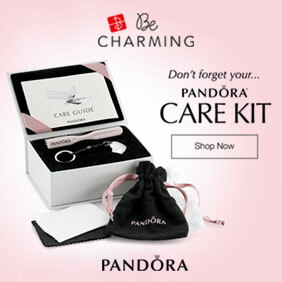 The design is perfect and I really hope to see more charms like this from PANDORA in the future. It is very versatile, as it is silver with barely any colour and the price is excellent for such a solid charm. 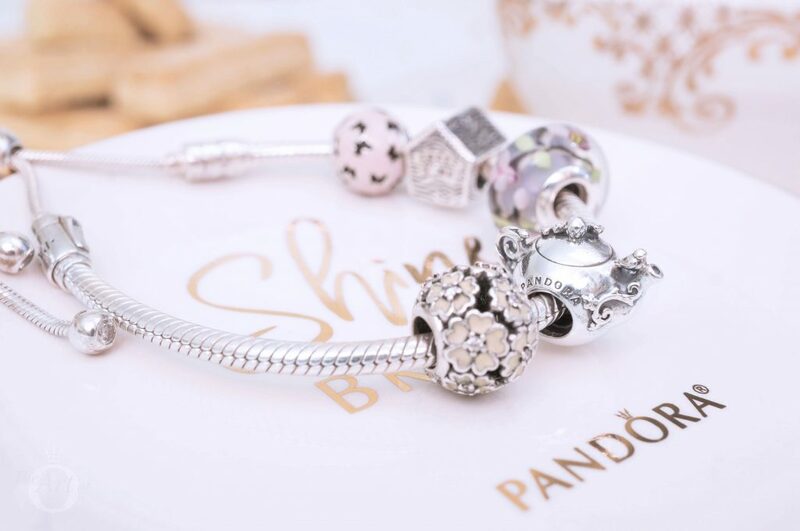 In the UK the PANDORA Enchanted Tea Pot Charm (797065CZ) is £35 and is available from the PANDORA UK eStore. 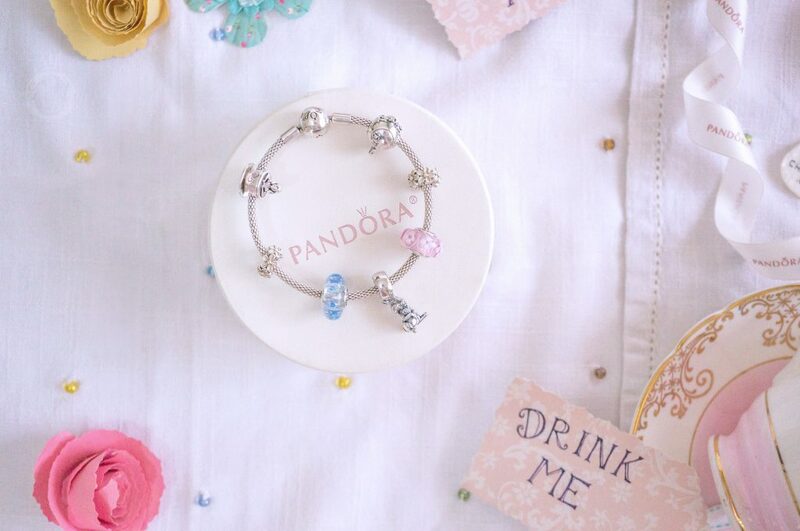 The PANDORA Enchanted Tea Pot is also available as part of the PANDORA UK Build a Bracelet promotion. 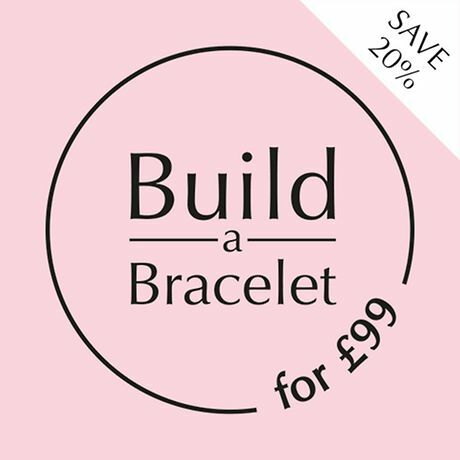 Pick a Moments Barrel or Heart clasp Bracelet, choose two items from a selection of charms, clips and safety chains and complete your purchase for £99. Really nice review! Congrats I love it! Thank you for reading it, I’m glad you enjoyed it. 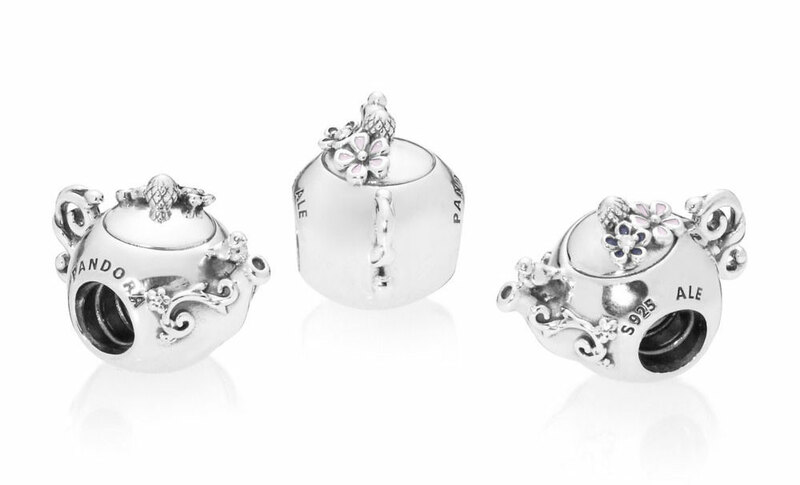 Do you have the Enchanted Tea Pot Charm? It’s so pretty. Gorgeous photos! The teapot is one of my favorites! Thank you so much. I’m really trying to improve my photographs and when I look back at older ones now I feel that I have made some progress. I love the photo aspect of the reviews as it is like creating a little world. Are you a tea or coffee girl? Thank you for a lovely review. I always enjoy your styling. I love seeing the charm you are reviewing but I also love seeing all the other charms you show. You always have some older ones and lovely new ones. Thanks for taking the time to write your reviews and taking your wonderful pictures. Thank you so much for your kind comment. I try to show how newer charms can combine with older charms too, so that readers can think about how the item would integrate into their collection. My next couple of reviews will be Disney charms from the Mother’s Day collection, so check back soon! 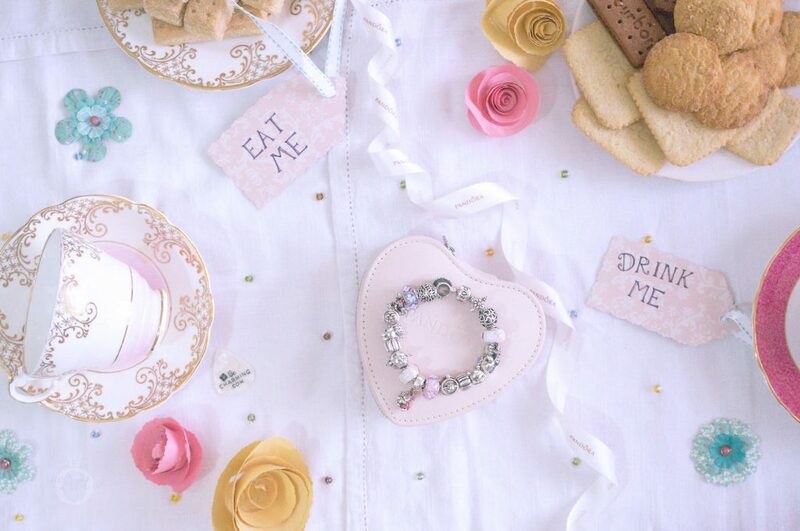 I absolutely love all the ways you styled the enchanted tea pot!!! Such gorgeous bracelet designs and your photos are truly enchanting and so well thought out!!!! Thank you so much for your sweet comment! I really enjoyed writing this review, especially finding tea quotes. There are so many of them! It looks like we might both have the same addictions; tea and PANDORA! The next couple of reviews will be from the PANDORA Disney Mother’s Day collection so stay tuned! 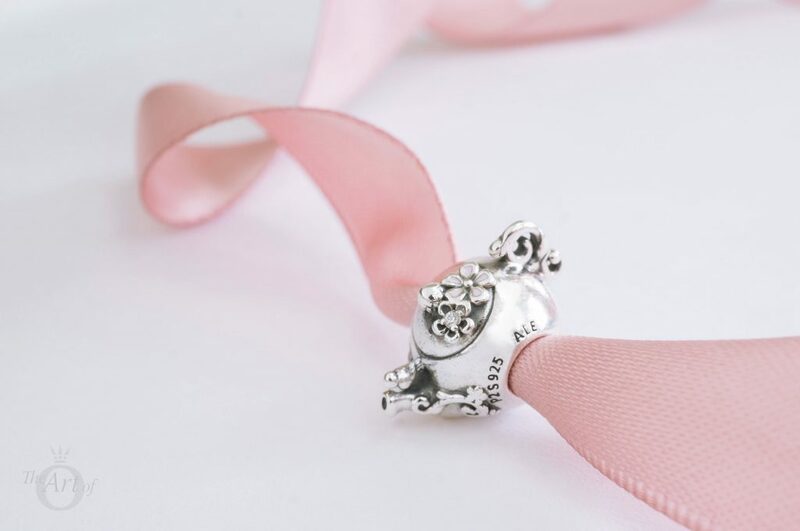 Love this charm, your HighTea Design is my favorite! Visiting the in laws soon and I usually have at least one afternoon tea with my mother-in law. When I travel I design a few bracelets to go with the theme of the trip. I purchased the new Tea Pot recently & will design an afternoon Tea bracelet. Thank you for the inspiration very helpful. Thank you for commenting. I’m pleased you enjoyed the review! I love designing bracelets to match the occasion and great to tell a story through PANDORA. 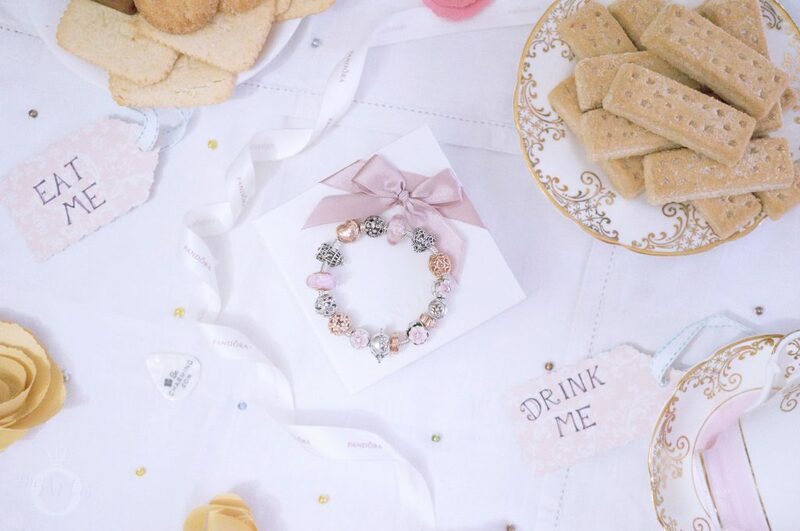 What other charms will you wear on your afternoon tea bracelet? It’s funny to think that tea used to only be used medicinally and now it is a normal drink. For me though it is still the medicine to many of life’s problems! 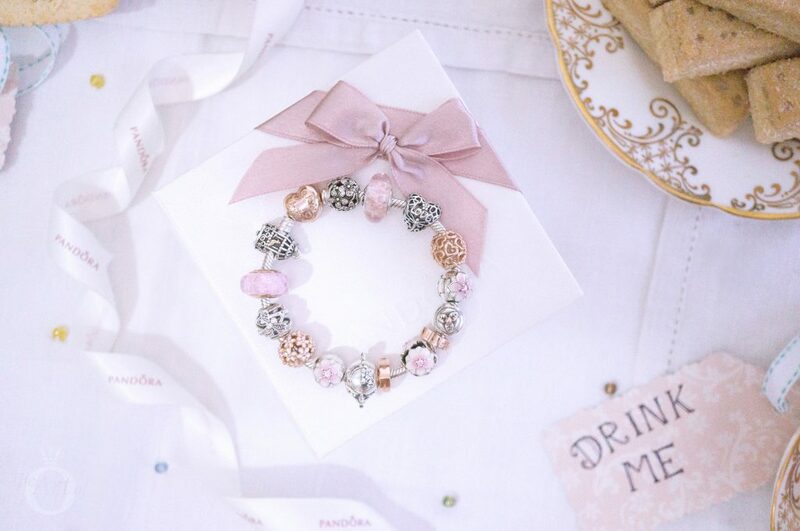 I’m really pleased you like the PANDORA Rose styling with the Enchanted Tea Pot, it is one of my favourites.